The crew grapples with interference from a giant alien asteroid in the "Star Trek: Discovery" Season 2 episode "An Obol For Charon." More spoilers than a Delta Flyer. A great many things made the original series of "Star Trek" stand out, way back in 1966, including Gene Roddenberry's vision of a unified Earth, cultural equality and underlying commentary on social issues at the time. "A Taste of Armageddon" (S01, E23) paralleled the Cold War and nuclear proliferation, "A Private Little War" (S02, E19) evoked the Vietnam War and "Let That Be Your Last Battlefield" (S03, E15) dealt with racial hatred. To quote the character Tim Bisley from the British sitcom "Spaced," "Modern science fiction is pretty interesting. The thoughts and speculations of our contemporary authors and thinkers have probably never been closer to the truth." We get a glimpse of this familiar Trek quality once again in the latest episode of "Star Trek: Discovery" titled "An Obol For Charon," which — thankfully — contains considerably less exposition and technobabble than last week's episode, "Point of Light." The title itself comes from ancient Greek culture and refers to the coin that was placed on or in the mouth of the newly deceased person as payment for Charon, the ferryman who carried souls across the river that separated the world of the living from the world of the dead. It is a suitable title, as you'll see as the episode unfolds. First off, we finally get to see Captain Pike's first officer, Number One (played by Rebecca Romijn), as she beams over to the USS Discovery from the USS Enterprise with some classified information. The character was originally played by Majel Barrett in the "Star Trek" pilot episode "The Cage" and the subsequent, recut two-part episode "The Menagerie" (S01, E15 & 16). Sadly, her appearance is limited to just the pre-credit scene, but fingers crossed, we get to see more of her as the series progresses. The classified information she has is a warp signature trail left by Spock's shuttle when he escaped from Starbase 5. Oh, and the Enterprise seems to be the only ship in Starfleet having problems with its holographic communication system. "Rip out the whole comm system, from now on we'll communicate using good, old-fashioned view screens," says Capt. Pike (Anson Mount). Phew, that re-establishes canon. Except for "The Next Generation" and "Voyager" and "Deep Space Nine" … maybe they should've just let that one slide. While tracking Spock's shuttle, the Discovery is suddenly plucked from warp speed and held firmly in place in front of a giant, alien asteroid. It starts playing havoc with everyone's universal translators, and for a few entertaining minutes the bridge are all speaking in different languages, from Klingon to Cantonese. Some sort of computer virus is attacking the comms system, and that's not the only contagion affecting the Discovery; it also becomes clear that Lt. Saru (Doug Jones) is not well. Not well at all. At first he thought it was just a cold — it is flu season, after all — but it turns it that it's much more than that. Capt. 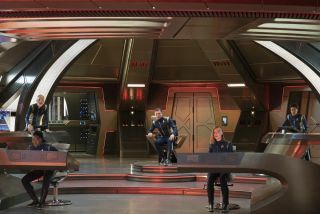 Pike (Anson Mount) consults with Number One (Rebecca Romijn), reporting from the starship Enterprise. Meanwhile, down in Engineering, we welcome the return of Cmdr. Denise "Jett" Reno (Tig Notaro) and her delicious, arid-dry wit. The dialogue between Lt. Stamets (Anthony Rapp) and Reno here is thoroughly enjoyable, and we get our first glimpse of the moral undertones this episode contains as they argue over the benefits of spore drive propulsion versus using dilithium crystals. "Spores are clean; they're renewable," Stamets says. "Do you have any idea how many planets have been ruined by dilithium mining? How battles were fought to corner its supply? Of course you don't, you're one of those people who never think about that," he says. This is also the first throwback to the "Star Trek: Short Treks" in this episode. Specifically, it recalls the episode "Runaway" that aired in early October of last year and the issues Po (Yadira Guevara-Prip) had with dilithium mining on her home planet of Xahea. Reno tries to isolate Engineering from the apparent virus attacking the rest of the ship, and in the resulting chaos the eukaryotic organism that Stamets sucked out of Tilly (Mary Wiseman) escapes from its quarantine chamber. Saru reveals that he is suffering from Vahar'ai, which we learned all about in the third episode of "Short Treks," titled "The Brightest Star." The Kelpiens live in a state of constant fear from the moment of birth, and at a certain time in their lives — when they feel the Vahar'ai — they make their way to a ceremony where they're vaporized so that the "Great Balance of Kaminar" is preserved. Something, for some reason, has triggered Saru's Vahar'ai to begin. However, Saru is the first of his kind to ever leave his planet, so he alone knows that, contrary to Kelpien belief, there is a reason to live and a cause to fight for. He recalls feeling truly at peace for the very first time when he interacted with the symbiotic life-form on the planet Pahvo in the first season episode "Si Vis Pacem, Para Bellum" (S01, E08). Cmdr. Burnham (Sonequa Martin-Green) and Saru share a deeply emotional scene, touching on the very current socio-political issue of refugees and immigrants as he talks of leaving his home, overcoming his fear, taking a risk and seeking to join something bigger so that he might better himself. It's handled well and reminds us of what "Star Trek" is capable of at its best. Meanwhile, down in Engineering, the eukaryotic blob of snot has attached itself to poor Tilly. Stamets and Reno hatch a plan to plant a subcutaneous communication device in Tilly's head so they can talk to it. Tilly now speaks with the menacing voice of May Ahern (Bahia Watson), and, again, this is handled well and is a nice nod to all those moments when Starfleet crew members have been possessed by life-forms evil and unknown. Tig Notaro appears once again as Chief Engineer Reno, bringing a dry wit to the science team. Turns out she's from the mycelial subspace domain, a.k.a. the spore dimension — call it what you will — and in fact all that earlier talk about being "clean and renewable" is a load of Denobulan doo-doo. Every jump that the USS Discovery makes using the spore drive is seriously damaging the mycelial ecosystem. After this revelation, the Blob swallows up Tilly and releases psychotropic spores into the air, resulting in some entertaining hallucinogenic horseplay with Stamets and Reno. The day is saved in the nick of time; despite the destruction of the alien asteroid, it has passed all its knowledge onto the Discovery … including the last known whereabouts of Spock's shuttle, since he was in the neck of the woods not too long ago. The search continues. Tilly, though, has been taken — we can only assume to the mycelial subspace domain — and Saru has undergone a change that will affect him for the rest of his life. Lt. Stamets (Anthony Rapp) converses with an interdimensional blob currently inhabiting Cadet Tilly. This episode and "New Eden" (S02, E02) are by far the best we've seen from Season 2. So, here's hoping that exposition and gobbledygook are kept to a minimum in the future and more emphasis is placed on plot and dialogue. Tilly wasn't annoying in this episode, which is always nice, and we see some beautifully balanced, tear-jerking scenes between Saru and Burnham. Finally, Reno adds a welcome dose of down-to-earth wit, since the technobabble-o-meter has been dialed up to 11 on more than one occasion in this season already. Oh, and more of Number One please.